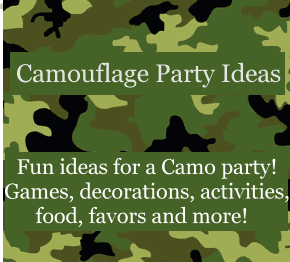 Fun ideas for a kid's Camouflage Birthday Party. This is a great boys party theme by itself and works well with a hunting theme also. Camouflage cards - Buy or color your own. Tear small pieces of khaki, light green, dark green and black construction paper into small pieces. Glue onto plain white cards for a Camo collage. Buy camo parachute men - the small toys - and write the birthday party information onto the parachutes in black or dark green permanent marker. Ask party guests to wear their camo for the party. Camouflage curtains (they look like netting) and hunting blinds. Dark green, brown and black balloons and streamers. Camouflage tablecloths, napkins, cups with green or black flatware. Place food and snacks in camouflage colored bowls and dishes. Scavenger hunts are always fun and are perfect for a camouflage party. See our scavenger hunt page for a complete list of all of our scavenger hunts with free clue lists to print out. Let the final clue lead to a hidden camo piñata. Buy camouflage t-shirts for each guest to wear at the party. Hide & Seek can be a great game to play at a Camo party. Paint the kids faces with camo paint and see who can hide the best from the other players. At night flashlights are fun to use for a game of flashlight Camo Hide & Seek. For this party game you will need an item that is camouflage colored such as a piece of cloth, army man or plastic toy jeep. The first player takes the item and "hides" it in the backyard - but the item cannot be completely hidden from view. They must try to camouflage the item so that it blends in with the background. After the item is hidden the rest of the players come out to a designated spot and try and find the item. They must stay within the spotting area and try to find it using only their eyes (or you can provide binoculars). On "go" start a stop watch and see how long it takes the kids to spot the item. The child who spots the item gets a point and the one who "hid" the item gets a point for every 15 seconds that their item is not found. Kids of all ages love to play capture the flag. For complete instructions see Capture the Flag. A few hours before the birthday party begins hide small toys like army men or objects like plastic gold coins. Send the kids out on a quest to recover the hidden items. They can take home the items they find as party favors or turn them in for bigger prizes. Set up a big obstacle course that kids will run through or have relay style races in teams. Teams compete to see who can finish the obstacle course first and individual players can compete with a stop watch. Make a mud pit that they have to crawl through or step through tires or hula hoops while all the other players throw water balloons at them. Stake several rows of string about 2 feet off the ground that they have to crawl underneath. Trampolines, swing sets and climbing gyms can all be used to make the course. Teams complete to see which one can fill their water jug first. You'll need a very large container filled with water for both teams to use and two plastic milk jugs - one for each team. Teams are given a spoon, sponge or cup with holes in the bottom and on "go" race to see who can fill the milk jugs first. The large container and the teams jugs should be a good distance apart ... the farther apart the more water they will spill while running to fill their jugs. See our huge collection of Outdoor party games for kids parties. Squirt gun games, water balloon games, pool noodle games and many more! Perfect for a Camo party! Face painting- paint the guests faces in camouflage colors. For younger children gather several big boxes and paint them in camouflage colors. Cut out doors and windows and make a large fort or two smaller forts to play in. In the summer have a water balloon fight. Decorate cupcakes with black, green and camo color candies. Mix up separate bowls of 3 or 4 colors of camouflage colored frosting and let the kids make their own camouflage cupcakes. Set up a camouflage candy buffet using all green, brown (chocolate!) and black candies to fill the containers. Have a cookout with hotdogs and/or hamburgers. Find more fun ideas on our Camping Birthday Party Theme page!